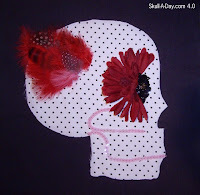 If you're up for a bit of creative quilting we could use your help at Skull-A-Day. Our editor Abby has come up with a wonderful fundraiser: She's asking that people make a 12" x 12" quilt square featuring a skull of some sort and then send it to her to incorporate into a quilt that we will then auction off to raise funds for the domestic violence organization Becky's Fund. If this is something that interests you, you can find more details HERE. And for inspiration check out Sarah of Rabbit-A-Day's own unique contribution which she made a part of her project! Thanks for sharing this. The more squares, the happier I am! This is such a great project. Thank you for the open invitation. I started my square yesterday and should have it finished today. Once I take pics, I will send the square your way. Thank you for inspiring me and others to create for a good cause! Fantastic! Glad to have inspired you!